After a 15-year struggle, the Supreme Court decided Sunday to deny a petition filed by real estate developers to build on Ness Ziona's famous Iris Hill, cementing its status as a protected asset of nature. Why all the fuss? The Iris Hill is home to the Iris atropurpurea (purple Iris) – a rare sub- species of the Iris oncocyclus family. 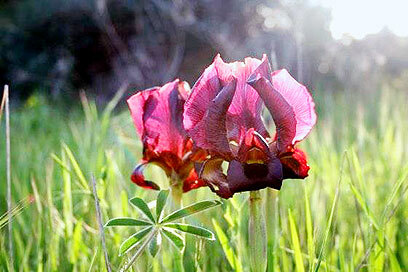 The Iris atropurpurea is considered an endangered plant; it grows only in Israel and is endemic to the Ness Ziona, Netanya and Rishon Lezion areas alone. The area also houses the last remnants of the once great Gravel Hill – a one-of-a-kind natural phenomenon, unseen anywhere else in the world, which once reigned over the Israeli costal plane; only to be eroded by urban development. "The unique park planned on the Gravel Hill, will preserve what one was a great feature of the coastal plane and was lost to great feats of infrastructure," wrote Judges Ayala Procaccia, Edna Arbel and Joseph Alon in their ruling. The three hailed the various urban planning commissions for recognizing the need to preserve the unique scenery, further ruling that the plaintiffs, who bought the land when it was still designated for agricultural development, could only hope the court would agree to reassign it as an urban development site. The developers' expectations, said the court, "had absolutely nothing to do with any right to proprietary". The Society for Protection of Nature in Israel was pleased with the ruling, but added that despite the hill being registered as a national park for some 25 years, an officials decree to that effect has yet to be made, leaving it vulnerable to real estate threats. 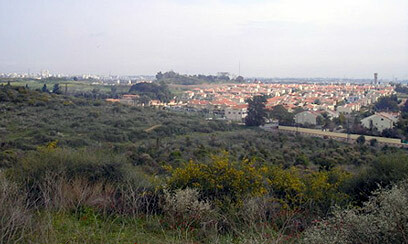 The hill, added the SPNI, has a unique concentration of Iris atropurpurea plants, which seem unable to thrive in other areas of Israel. "We are pleased that the court gave this issue a priority, letting all real estate developers know that open areas will remain just that – open; and that they have no way of making real estate deals pertaining to them," Alon Rothschild of the SPNI told Ynet. The fight, however, is far from over, as the SPNI now plans to appeal to the Israel Land Administration and the Ness Ziona Municipality, to have the Iris Hill officially declared a national park. Ness Ziona Mayor Yossi Shvo welcomed the court ruling as well, saying that the land owners will be compensated in accordance with the land value; adding "the real winners of this ruling are the people of Ness Ziona." See all talkbacks "The little flower that could"